Discussion in 'Masonic Blogs' started by My Freemasonry, Sep 13, 2012. 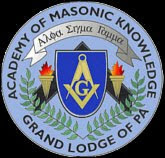 The 2012 Fall session of the Pennsylvania Academy of Masonic Knowledge will be held on Saturday, October 27th, in the Deike Auditorium of the Masonic Cultural Center on the campus of Masonic Village in Elizabethtown, Pennsylvania. Registration will open at 8:30 AM with the program beginning at 9:30 AM. A lunch (voluntary contribution) will be served at noon and the program will be completed by 3:00 PM. All Masons are welcome to attend. Dress is coat and tie. â€¢ Brother Alton G. Roundtree, Past Master of Redemption Lodge No. 24 PHA (District of Columbia) and coauthor of Out of the Shadows: The Emergence of Prince Hall Freemasonry in America. â€¢ Brother Andrew Hammer, Past Master of Alexandria-Washington Lodge No. 22 (Virginia) and author of Observing the Craft: The Pursuit of Excellence in Masonic Labour and Observance. The great objective in Freemasonry is to gain useful knowledge, and the Academy provides a great opportunity for the Brethren to learn and to understand more about the significance of the Craft. Plan to attend and bring a Brother or two along with you. Pre-registration is required. To pre-register, e-mail Brother Shawn D'Ignazio at dignazio@yahoo.com with your name, address, Lodge number, and telephone.